Carol of Brown Quilts sent me a yard of this green and brown woven stripe so I could make more of these blocks; Carol, you are the best, thank you so much for taking the trouble to do that! I could have hunted for that woven for a very long time, I do believe. I used up the last of my small piece an hour before Carol's yard arrived, so there was not even any lag time :-). So now I have nine blocks. I have the feeling in mind of what I want to do with these blocks, but can't quite decide on the setting. Add some of this log cabin block on the diagonal around them? 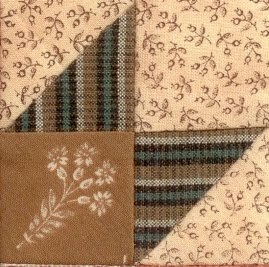 Use this brown and green woven plaid (that goes so well with the green and brown stripe) as their setting triangles? Put a medallion something in the center? What to do, what to do. They're so cute, I want to do justice to them. And Melisa of Sweet Home Quilt Co. in Conyers GA had that brown and black stripe; incredible! I drove down there yesterday and nabbed it. Melisa said she had 1,000 blog posts when she returned from Market in SLC; I am just a very lucky girl that she happened to see my Post of Desperation. Melisa has such pretty antique primitives in that lovely house-shop. Sigh. Love primitives. The beige background print from Harper's Ferry is proving elusive; I am posting that on missingfabrics.com. 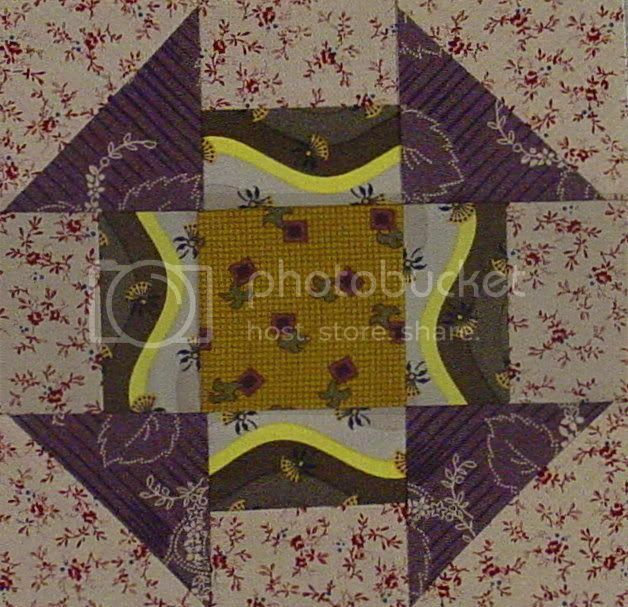 It certainly is lucky for us Needy Quilters that Tricia Cox runs that wonderful site. I believe I have found the fabric each time I have posted there. Moral of the Story: Always buy lotso lotso fabric. Holy Harry, it is hot in Atlanta. Ninety-five as I write this. The little heirloom tomato plants are doing beautifully so far, even though I started them very late. See how they are cleverly hiding themselves under their paper tents from the dreadful burning Georgia sun. The "normal" tomato plants from Pike's, planted earlier, also seem very happy. Now where is that tomato food? I am looking for that background fabric. I know I had it but I think it might be in a batch I gave away. :( I will keep looking. glad people pulled thru for you , I looked didn't have any of those sorry. and yes, buy lots of the fabrics you love! You had me at "heirloom tomato." We have one of those upside down tomato plants, but I'm not optimistic. It was 100 here today...groan. I put in a tomato plant before I went to Utah. I wonder if it is still alive? great care has not been taken. Your blocks are great! Hope you find enough of that HF fabric. Your CW block is awesome! Both in fabric and medallion. How'd you do that?